By Asia Hege on February 24, 2015 | Comments Off on Is ICT4D Slowly Dying or Slowly Changing? At the September 23 Technology Salon, attendees faced a question: Is ICT4D slowly dying or slowly changing? Earlier this year, James BonTempo, Director of ICT and Innovation at Johns Hopkins CCP wrote that ICT4D is slowly dying. 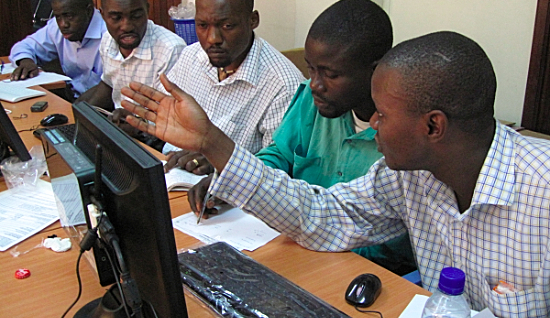 ICT4D enthusiasts had a lot to say in response (don’t miss Part II of BonTempo’s blog post). While Salon attendees fell on both sides of the debate, I found it interesting that a general trend within development organizations is the demand for hybrid skills. Development organizations are recognizing the value of employees that understand both technology application and development. Desirable employees can assess programs and the correct applications of technology, no matter how simple. Traditional job roles such as “IT” or “Programs” are dying, more so than ICT4D. The claim that ICT4D is dying is not outrageous. It’s no secret to technologists that tech evolves and job markets change at a rate quicker than most can keep pace with. Proponents of the Slow Death would argue that tech has become much more accessible (i.e. mobile phones), and as everyone learns to use these tools, “specialists” are no longer crucial. It is also true that technology is becoming more and more integral to all types of jobs, not just technical roles. At some organizations, ICT training is part of a new job. However, while many organizations aspire to this level of technical savvy and intelligent application, few development organizations are close in reality. This seems to be a more accurate synopsis. Most nonprofits, NGOs, agencies and even private companies are trying to adjust to technology trends, and use them to promote their mission. While ICT4D might be an established field, many organizations are still trying to figure out how to do ICT4D in constantly changing landscapes. Creating Toolkits and Resources- One organization that emphasized an increased use of ICT created toolkits for their colleagues to use in similar situations, to standardize best practices across the organization. Increased Tech Requirements- Another organization has infused tech across departments by seeking candidates with more technical skills, valuing IT skills, and incorporating them into most roles within the organization. Top Down Support- Every organization that has infused ICT across their programs said it is necessary to have commitment from leadership. Without support from senior leaders and an understanding of how ICT enhances a mission, these other methods are less likely to succeed. Of course, the more successful organizations used all four approaches, and many more, to make sure ICT4D wasn’t dying or slowly changing, but changing as fast, or faster than the environment the organization works in.